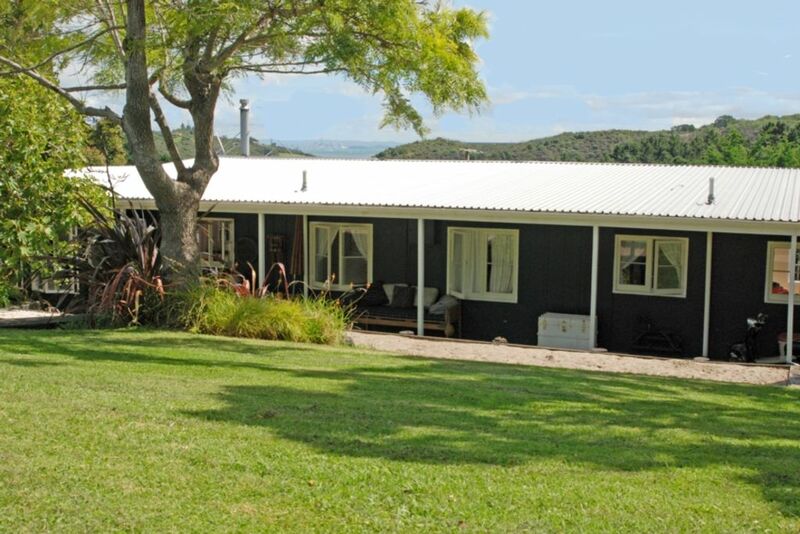 Relish your Waiheke stay in this lovely, private, island home; beautifully furnished and oozing character and comfort with views of the countryside and the city in the distance. The sunsets are stunning! Cook up a late lunch in the Smeg oven. If it's nippy outside, enjoy a few bottles of around the long country-table. Go late into the night in front of the fire reading books and magazines from the owners' library, doing puzzles or playing board games ... or just yarning. If barbecuing's more your style, then there's a great Weber Q at the ready and if the sun's shining, eat the day's fishing catch outside under the laden fig tree (help yourself!) or on the north-west facing deck and enjoy the sun till it sets behind Auckland city in the distance. This property is very close to the Matiatia ferry (and bus stops), a short stroll to Oneroa village's shops, award-winning cafes, quirky cinema and stunning beach, and not far from Waiheke's famous coastal walk. It's also great if you have kids; one level, fenced, flat lawn and nothing 'too precious', able to provide loads of kids' toys, cot and/or bassinet, stroller upon request. Huge sandpit/petanque 'court', trampoline and tree hut will keep them occupied for hours! NB: Late (afternoon) checkout can usually be accommodated. Sleeps 6, but really only two couples and 2 children max. MySky TV - incl Sport. Good things: Attractive garden. Afternoon sun til late on big deck. Well equiped kitchen. Tasteful character rich decor. Excellent library. Great master bedroom mattress. Close to Oneroa village and Oneroa beach. Not so good: Average beds in bedroom 2 and 3 - really only good for small kids. Bathrooms average. Very peaceful. Nice views back towards Auckland city. Spaceous living areas. Nice master bedroom and two smaller rooms. Tiri Corner is a beautiful place to watch the sunsets over Auckland City. Tiri Corner is a beautiful place to watch the sunsets over Auckland City. Its very close to the Matiatia Ferry, Oneroa and Little Oneroa beaches, Oneroa Town and has a lovely sunny aspect. The house is very comfortable and pleasant to stay in. I would recommend to anyone and wish we were there now!! The house has a beautiful view of Auckland City and surrounding landscape, although the view of the sea is limited. It is a short distance from the city center. I would recommend the local beaches and bush walks.